Generally, we don’t spend a lot of time thinking about chicken feeds. We buy a bag for our hens, add our own mix, and that’s about it. But nothing can be more important for your chickens than the feeds you’re giving them. If you give your hens the best chicken feed, you’d be rewarded with robust, healthy hens that lay many eggs. Feeding them with ordinary feed isn’t necessarily bad, but you won’t get as much in return. And if you feed them with the wrong feed, then your hens would be unhealthy and lay only a few eggs. The companies the produce chicken feed know this and that why they’ve invested a great deal of time, research and effort into manufacturing the best chicken feed for your hens. But not all commercial chicken feeds can be considered the best, and some are just as good as ordinary. With that thought in mind, we’ve created this review post to look at the best chicken feeds on the market today and recommend the right brand for your needs. You will discover the components of each feed and learn which one to feed your flocks. We’ve also included a brief and comprehensive guide on how to choose the best chicken feed – the different factors that you need to consider – on the latter part of this article for you to make a good buying decision. So make sure you read this post till the end – we promise it would be worth your time. The Prairie’s Choice comes in layer formula and grower formula. The manufacturers are known for providing non-GMO ground corns and non-chemically treated soybean feeds. A big bonus for this feed is that its ingredients contain salt, phosphorus, calcium, fiber, fat, and protein. I also like that the feed has additional nutrients like Vitamins A, B-12, D-3, E, folic acid and many others are mixed with the feed. This layer formula applies to just egg-layers. The grower formula has a bit more protein that egg-layers don’t require much of. The feed is stored in 25 lb bags. 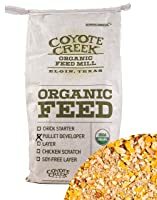 Coyote Creek feed is great for novices, egg-layers and developing pullets. The feed combines roughage products, organic milo, organic soybean meal, organic corn and many supplements and vitamins which are a bonus for me. They provide soy-free feeds for egg-layers. The feeds are non-GM and organically certified. They’re sold and delivered in 20-lb bags. This complete, high protein, vegetarian diet for growing chickens contain probiotics, vitamins, and minerals. With up to 18% of protein, you can expect these feeds to help grow and develop your chicken’s muscles. The feed also comes in crumbles which are easy to eat – making them a feasible option for chicks. 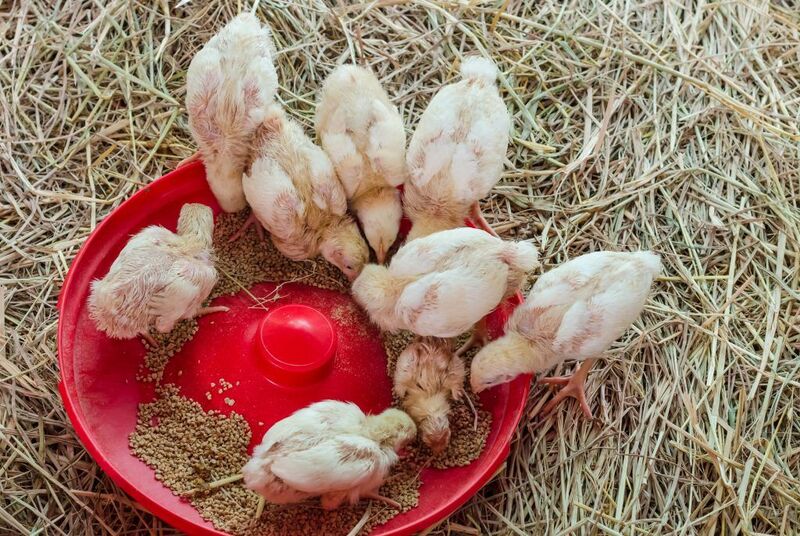 Essential amino acids help fortify their growth properties for your chicken’s development. All organic, non-GMO organic feed is made up of sesame meal, peas, barley, wheat and a variety of supplements and vitamins. They provide feed for growers, layers, and starters. I really like that their feed is soy and corn free. It also has an oyster shell and grand limestone to help in digestion. The feeds are stored in 25 lb bags. This chicken feed has wheat middlings, soybean meal, corn, and supplements. 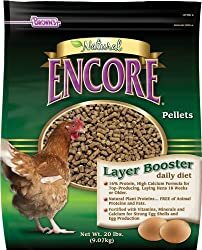 The Brown’s Layer Booster Chicken Feed also has a mix of vitamins A, D-3, and E. They boast of having natural plant protein, while the significant feed is integrated with layers such that they provide starter feeds. The feeds are stored in 20 lb bags. 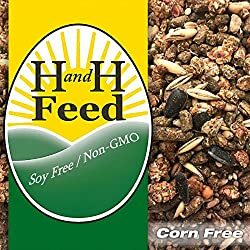 H and H Feeds are Corn and Soy Free, made from organic whole grains and certified non-GMO. 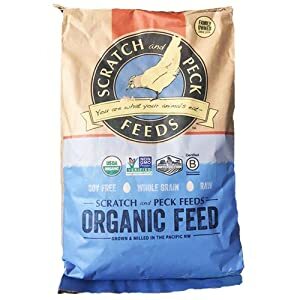 This natural and layer-free feed has at least 19% protein and uniquely formulated to promote a nutritious and balanced diet for your chicken. They are suitable for feeding hens 20 weeks old and over. All of the feeds are canola and soy free, while the Naturally Free product lines are also corn free. The feeds are completely raw due to the manufacturer’s limited processing technique. 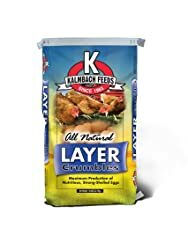 Kalmbach provides feeds for egg-layers and growers with the choice of purchasing organic feed with Omega and high Omega for all natural and egg-layers. The layer crumble has higher calcium and amino acid content for stronger eggs. Its ingredients contain wheat middlings, grains, soybean meal, corn and a variety of supplements and vitamins. Depending on your purchase, the feed may be stored in 40-50 lb bags. 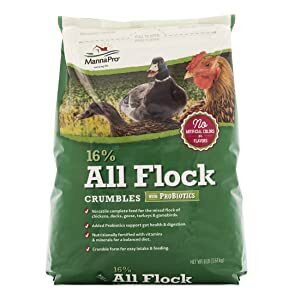 The Manna Pro All Flock Feed applies to different flocks – chicken, gamebirds, turkeys, geese, and ducks. Uniquely formulated with probiotics, the feed supports gut health for a healthier bird. The feed is fortified with vitamins and minerals for a well-balanced diet. Made as crumbles, they are easy to feed and ingest. I also like the fact that the feed has no artificial flavors and colors. Through the years, the industry has done extensive research and worked in refining the nutritional requirements for poultry – from turkey, chickens to quail, and chicks to adult. The resulting feeds were designed to optimize the health and growth of each egg-laying bird. This is much different – and a significant improvement - compared to how our ancestors used to feed chickens. In the good old days, chickens have to settle with what’s available inside the barn and offerings from the owners were additions. • Protein: The amount of protein needed to be mixed into the feed varies in proportion to the bird’s type and age, but they are a significant requirement. • Amino acids: Methionine and lysine are the most common. • Vitamins: Often, vitamins A, B12, D3, and E along with trace minerals like copper sulfate and phosphorus. • Enzymes: Enzymes along with fiber aids in the digestion process and they come as grains mixed into these products. Some feeds also have additives like Omega 3, although this may vary in between brands. The additional Omega 3 will increase the Omega 3 count inside the egg and make them healthier for eating. Always go through the product labels so you’d know the contents. You’d also find labels at the bottom of the feed’s sack or within the case of small feed bags, or you may find them on the bag itself. Its common sense that the type of chicken feed you need to choose will depend on the type of chicken you have. Here we will list some of the most common feeds for different types of birds. If you’re growing meat birds, then common sense will tell you that they need more protein content than other types of birds for their rapid growth. Without sufficient amounts of protein, they won’t thrive and even suffer from major health problems along the way. Broilers, in particular, need these proteins since they have a very short life – sometimes only five weeks before they’re culled. During this period, they must have a high protein diet – at least 22 – 24%. The industry has worked things out for us. They’ve made feeds with 22% protein for broilers. These can be fed to hatchlings without modifying or changing feeds, so they’re a one-time investment. The feed is also composed of essential nutrients required for the fast and steady growth of these creatures. As its name implies, All Flock Feed applies to different types of birds including ducks, turkeys, and chicken. However, the protein amount required by game birds such as chicken is much higher. The feed generally contains roughly 16% of protein along with key minerals and vitamins. It shouldn’t be utilized for birds below seven weeks old. Personally, I think these feeds are best as maintenance feeds for adult birds. Many farmers use fermented feed since they can easily feed it to their small flock. These types are actually healthier and safer for your animals. The process involves soaking grains and feeds to release a lot of the locked nutrients and make them available for the birds. This feed is also a more affordable option since it generally requires less feed. Starting the process isn’t difficult, and it will keep you going. It doesn’t take much time, and your hens will benefit from it. 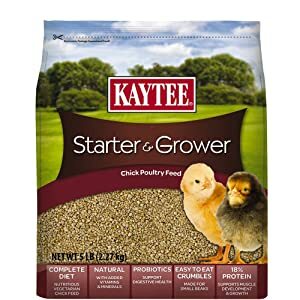 There are roughly two types of chick feeds grower and starter feed. What’s the difference? Starter feeds are feeds you can use for hatchlings. Chicks love eating these until they’re six weeks old. From the sixth week, you can then gradually shift to grower rotations. Starter feeds have 20-24% protein and provide the chick with the needed metabolic energy to grow rapidly. Grower feeds have a bit less protein at 18%. This may not seem like a huge difference, but too much protein can lead to kidney problems later on in your bird’s life. Majority of layer feeds, whether mash, pellets, or crumble are consist of 16% protein, and it is right for free-range and confined chickens. Majority of commercial feeds already have calcium and remind users in the instructions not to include oyster shell grit in the feed. If your chickens are free roaming with access to fibrous insects and plants, you can provide them with crush granite grit. Some manufacturers produce feeds with higher protein layers, either for adult hens or as an over-all formula. For older hens who have become less regular layers, some extra protein can add some energy into their bodies and nests. All-flock feeds are just right for several poultry types. An 18% layer feed is a fantastic option for chickens during their annual molting, also, as hens need more protein for egg production and make new feathers. All the chicken feeds we’ve reviewed on this list are an excellent choice for your flocks. Depending on your needs, we definitely recommend one or several of the brands on the list. Keep in mind though that there are several factors you need to consider when choosing the right brand for you.